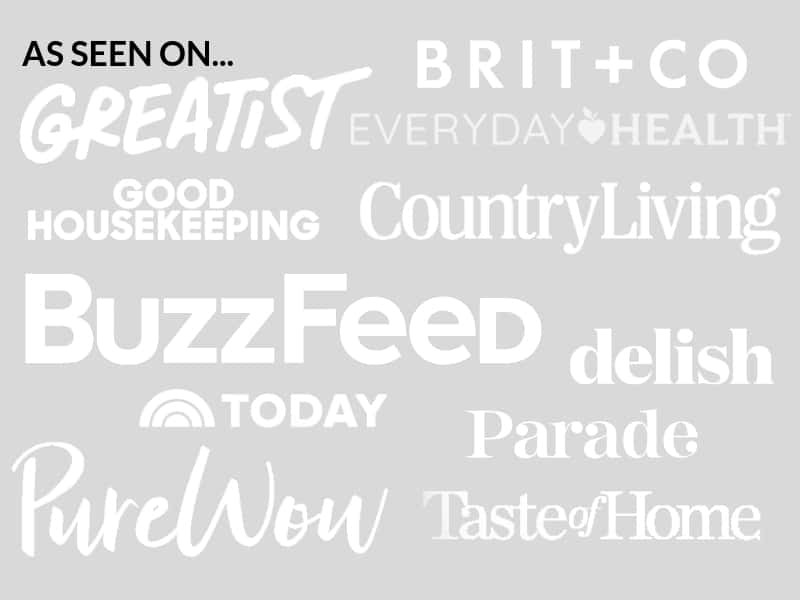 January 12, 2018 By Elizabeth Lindemann Leave a Comment / This post may contain affiliate links. This Winter Citrus Salad with Red Wine Vinaigrette is a version of one of my sister’s favorite childhood recipes (and what better day to post this than her birthday? Happy birthday, Katherine!). It’s packed with seasonal citrus (Mandarin oranges, grapefruit, and/or Meyer lemons), thinly sliced mushrooms, and toasted almonds. 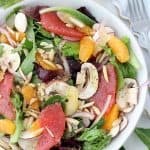 It’s dressed in a super simple red wine vinaigrette that goes well with any salad, but really brings out the sweet and tangy citrus flavors in this salad. And best of all? You can make it in advance for easy meal prepping (see recipe notes). This recipe is part of Bowl of Delicious’s month-long Mediterranean Diet theme. The red wine vinaigrette is my standard dressing for any Greek salad, and brings the flavors of the Mediterranean into this salad. While the ingredients themselves may not scream Mediterranean, the recipe fits the bill for the diet perfectly, since it’s packed with plants and a dressing made of extra-virgin olive oil. I always forget how much I love raw mushrooms. They are PERFECT in this salad- their earthiness paired with the bright citrus is amazing. And the toasted almonds add a pleasant crunch to each bite. I used baby portobella mushrooms and sliced them myself so they would be really thin. When you prep mushrooms, I recommend using a towel to wipe away any visible dirt, rather than washing them in water. They are super spongy and absorb the water easily, affecting their texture. Feel free to use pre-sliced, pre-washed mushrooms as a shortcut. For another shortcut, use canned (and drained) mandarin oranges and/or grapefruit. I was an overachiever and used three kinds of citrus: orange, grapefruit, and Meyer lemon. You can use any or all of them (but be warned: while the Meyers are sweeter than other lemons, they are still very tart!). Make sure to use a good quality extra-virgin olive oil for the dressing- my go to that’s available at almost any grocery store is California Olive Ranch Extra-Virgin Olive Oil. 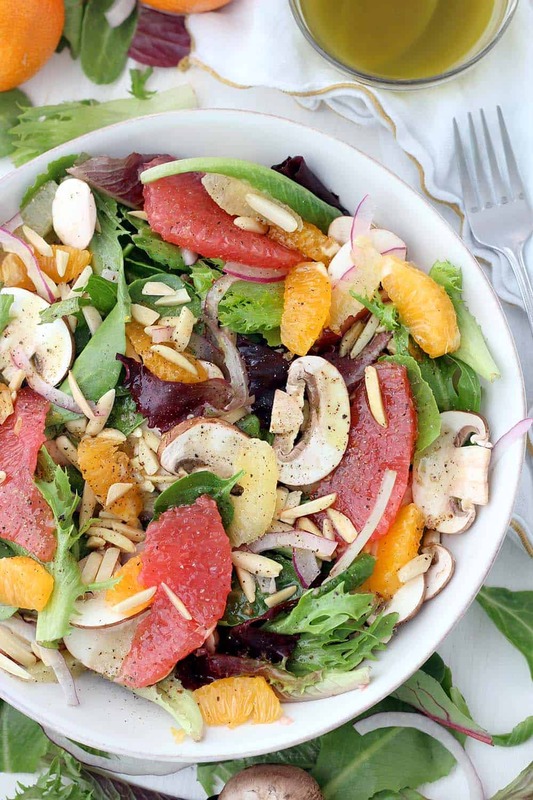 If you like this, you’ll love this roasted beet salad with grapefruit vinaigrette. 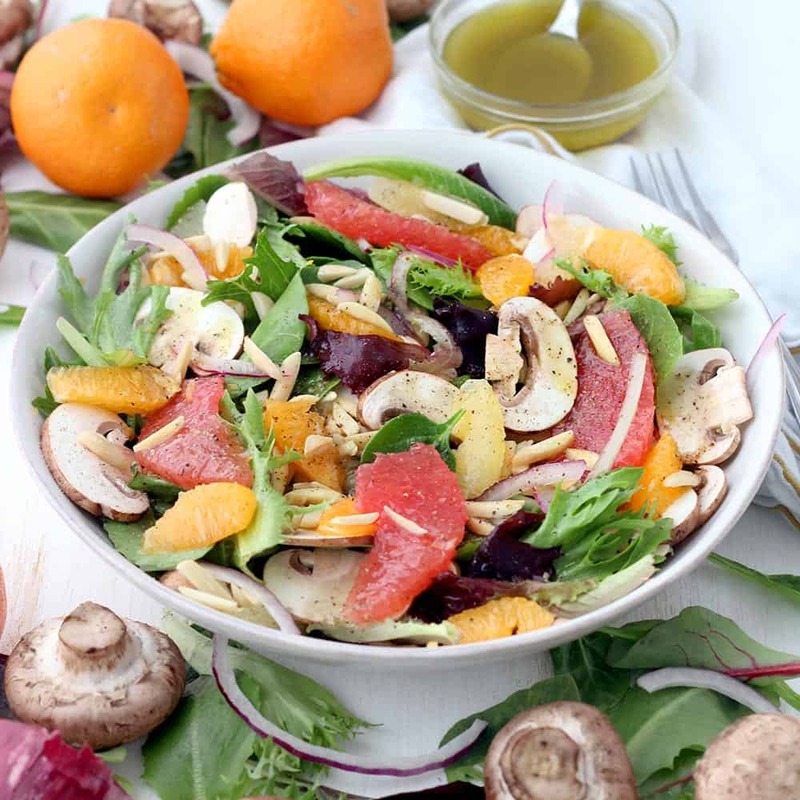 Here’s the (extremely easy) recipe for Winter Citrus Salad with Red Wine Vinaigrette! 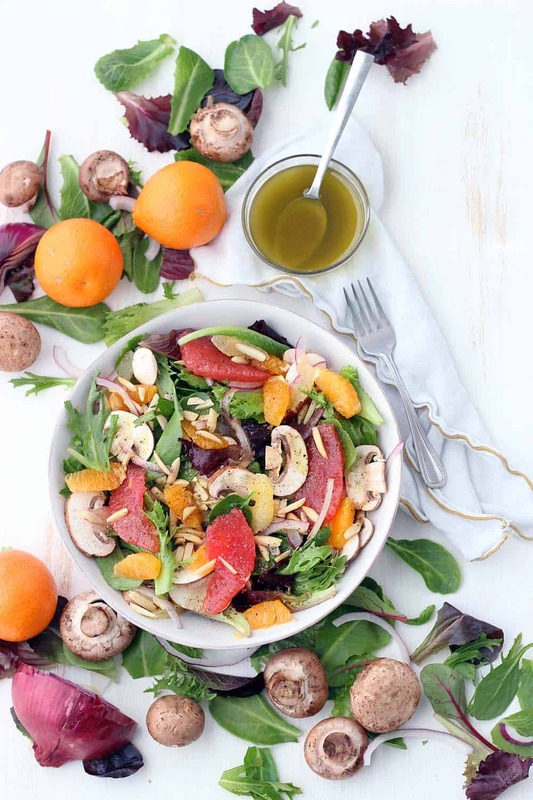 This delicious Winter Citrus Salad with Red Wine Vinaigrette is packed with seasonal Mandarin oranges and grapefruit. It's tossed with thinly sliced mushrooms, toasted almonds, and a versatile red wine vinaigrette, and is a great recipe for meal prepping! Whisk ingredients for dressing together in the bottom of a large bowl. Taste and adjust seasoning if necessary. Add the greens, citrus slices, red onion, mushrooms, and toasted almonds to the bowl. Toss to mix well. If making this in advance (for meal prep lunches or otherwise): mix the dressing and store separately, mix the greens, mushrooms, onions, and almonds together, and store the citrus slices separately. When you are ready to serve, mix the citrus in with the rest of the greens mixture and mix dressing in. Otherwise, the greens will turn very soggy.